This page was written by Alison Bailey of the Chesham Bois History Group, with help from Roger Cook and others. The earliest maps of Chesham Bois are the Cheyne’s Estate maps of 1712 and 1716 and the Duke of Bedford’s map of 1735. These show a scattering of buildings around Chesham Bois Common in what is now North Road. These are Manor Farm and its associated farm cottages and the Parsonage (later the Rectory). The land was originally agricultural land bordering the Common and we know that brick makers had been collecting bracken from the Common from the 16th century to fire brick kilns in the area and that many of the hollows found today on the Common, including Bricky Pond, were dug out by brick makers for their clay. 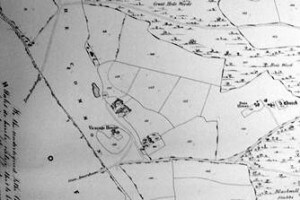 There were brick kilns on Brickets Field, also known as Bowling Alley field in the 1735 map and the two semi-detached cottages built here around 1810 were built for brick makers and farm labourers. The cottages were built for Elizabeth Kingstone, the owner of Manor Farm. The 1838 Tithe Map and Listing show that one cottage was occupied by James Rance a farm labourer, his wife Mary and his family of five children. Still living here in the 1851 Census, James is listed as a farm labourer, as is his son Joseph. His wife, Mary is listed as a straw-plaiter, as is his 9 year old daughter Lucy. However his 21 year old daughter Mary is listed as a school mistress. She was the school mistress at Chesham Bois village school, at that time on the corner of Chestnut Lane and Bois Lane (now the Old Schoolhouse). In the 1881 Census William and Mary Ann Aris are living here with their 3 sons, William, Arthur and Percy. The 1838 Tithe Listing shows that the second cottage was occupied by Joseph Saunders, a farm labourer, his wife Jemima and six children. Joseph was a farm labourer for Manor Farm. In the 1851 Census, Jemima and Joseph are still living in the cottage working as a straw-plaiter and farm labourer together with their daughter Mary (18) also a straw-plaiter and son George (26) a shoemaker. George later took over his father’s job on Manor Farm and stayed at the property until it was demolished sometime in the 1890s after the land (lot 7) was bought in the 1896 auction by J V Watson. The 1881 Census shows the Aris family and the Hance family, who later lived in Fern Villas also living in the cottages. Kensworth , the large country house built on the site in 1899, was built for and occupied by John Gibbon How, a local solicitor and his wife, Alice. The house had a lovely, very large garden which was created when John Gibbon How purchased additional land from Dr Frederick Mott who had purchased the adjoining lot 6 in the 1896 auction. This meant that the so called ‘New Road’, now Long Park, was diverted from its planned route and instead turned sharply around the Kensworth garden following the original hedge line of ‘Batchelor’s Parke Field’ marked on the 1735 Tithe Map, shown above, and then down to meet the track on the common which became North Road. In the 1911 Census John Gibbon How and his wife Alice are living there with their 5 year old son, Charles and four servants; a cook, a parlourmaid and two housemaids. John Gibbon How, the son of solicitor Frederick How was a partner in the Chesham firm Francis & How and was clerk to Chesham Urban District Council. After his death in 1917 Charles Ratcliffe lived at the property until it was sold to Rene Ross after WWII. The Ken House Hotel: Rene Ross and his wife, the daughter of the managing director of EMI at Hayes, turned Kensworth into a hotel. The entrance was moved to Long Park and they lived at The Hollies, on the corner of Parkfield Avenue and Grimsdell Lane. It is still remembered by local residents but mainly for being damp and very old fashioned at the end. After it closed down it was left empty for many years until it was vandalised and burnt down in 1987. It was finally demolished in 1989 and replaced by Laurel Court. The next houses to be built here were Fern Villas. The villas were built in 1888/9 for William Aris. 1 Fern Villas, now Fern Cottage William Aris was a wood turner and his wife Mary Ann and children moved into 1 Fern Villas. In the 1891 Census there are seven children living at Fern Villas. The oldest boys William Henry (17) and Arthur (15) are listed as a shoe maker and a shoe maker apprentice respectively, Percy (14) is an errand boy. William Henry didn’t stay as a shoe maker though. A ‘bakehouse’ was built at Fern Villas. It is reported that initially it was used to fire bricks and later by local people to bake their prepared bread. William Henry started to bake his own bread and opened the village’s first shop to sell his bread in the early 1900’s. His shop was replaced by Anne’s Corner in 1910 but he continued to sell his bread in the shop and post office in 5 Anne’s Corner. In the Chesham Bois Parish Council minutes of 15th February 1898, William Aris, and William Gomm (the well-known local builder) are “nominated to serve the office of Constables for the year ensuing”. William Aris held this position for several years and was responsible for maintaining order in the parish. All the Aris boys, including William senior played cricket on the Common. The family were granted commoners rights on Chesham Bois Common and Harry Aris (born 26th May 1885) was the last person to hold the rights to graze cattle, to cut bracken and fodder. William Aris died on 1st April 1915 but Marry Anne lived on in the house until her death on 19th April 1943. The original intention was that when their parents died Harry would live in one house and his sister, Kitty in the other, but neither married so they shared what is now Fern Cottage. After Kitty’s death, Harry lived alone in Fern Cottage having his house looked after by his neighbour Irene Porter who rented the Rowans. When he died on 12th July 1973 he left the Rowans to Irene and she lived in it until 2008 when she had to go into Chesham Bois Manor Home. Chesham Bois CC Season 1914 Standing: J. Tomlin, A. Bolton, A. Horwood, P. Collins, E. Grimsdell, P. Pearson, H. Gayler Middle Row: W. Heath, A. Cook (Capt), Arthur C Aris, Front Row: Percy G Aris, F. Cox, H. Atkins. 2 Fern Villas (also known as Roseheath and the Rowans) In 1901, 2 Fern Villas was occupied by Abel Hance, a railway plate layer and his wife Alice and family. They also are shown in the 1881 census living in one of the semi-detached cottages replaced by Kensworth. Newstead In June 1963 Harry Aris sold a strip of land adjoining ‘the Rowan’s’ which gave access to his orchard. A local builder bought the land for £1,625 and built Newstead (also known as Courtlands) there shortly after. Woodside and Wayside (which was also known as Nyumbia and the Kangle) were built around 1910 by local builders William Gomm and George Pearce. They were owned by William Aris and let out to a variety of tenants. Bois Cottage was originally accessed from the Common. Today the entrance is in Long Park Close. The cottage was first built around 1894 as a wooden bungalow. In 1902 Henrietta and Mary Busk, two unmarried sisters from Bloomsbury bought the property as “a refuge from the noise and bustle of town”. Henrietta Busk was a pioneer in women’s education and lifelong supporter of Bedford College. The elder sister, Mary, was a keen gardener and extra land was purchased to make a large garden with woodland in front and a field at the side which was used as a riding school. Mary died in 1921 and Henrietta sold Bois Cottage in 1932 to return to London for the rest of her life. The bungalow was replaced by the current house in the 1930s. In the early 1900s Chesham Bois Common was much more open with few large trees. Animals still grazed there and it was mainly covered with gorse and bracken. There were very few gravelled or metalled roads before the War. Most roads were little more than muddy tracks lit at junctions by the odd gas lamp. Regular heavy wagon loads of cut timber passed up through the village and empty wagons were taken straight through Bricky Pond to give thirsty horses some water. After many complaints that the Common was being cut up by heavy carts, new roads were built either side of the Common (now North and South Road) through local subscription. £200 was raised by 42 residents, organised by Henrietta Busk, who in 1905 had been elected to Amersham Rural District Council (she was one of the first woman councillors of any council in Buckinghamshire). The scheme was given a “send-off” when local dignitaries attended a ceremony “to turn the first sod”. “The Chesham Bois Troop of Boy Scouts attended under Assistant Scoutmaster M. Beckley, with their banner, and added colour and picturesqueness to the ceremony” (Bucks Examiner report July 8th 1910). Henrietta Busk then hosted a garden party at Bois Cottage for all the subscribers to celebrate these new roads in the village.